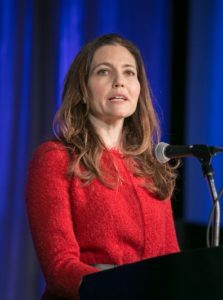 Assistant Secretary of State Evan Ryan announced in her plenary remarks at The Forum’s Annual Conference the creation of a new Study Abroad Branch within the U.S. Department of State’s Bureau of Educational and Cultural Affairs. Read the full text of the Assistant Secretary’s remarks below. Thank you, Brian, for the introduction and for the opportunity to speak here this morning. I am delighted to be here with you today on behalf of the U.S. Department of State. It is a particular pleasure to speak to a room full of people who believe as passionately as I do in U.S. education abroad. I would also like to say thank you for all the work that you do on a daily basis to provide American students with the life-changing experience of studying abroad. I greatly appreciate your tireless efforts in promoting and advocating for study abroad – as well as all the work you do in developing or identifying programs that allow students to have a transformative, educational, and safe experience. Having studied abroad myself, I can personally attest to the transformative experience of studying outside of your own country and comfort zone. Of course, when I studied abroad as a college junior, I never would have imagined I would hold the position I am so honored to have today, leading the State Department’s Bureau of Educational and Cultural Affairs – or ECA. My mandate at ECA is to use exchange programs to build friendly, peaceful relations between the people of the United States and the people of other countries. We engage Americans and international participants to foster mutual understanding worldwide. We do this through academic exchanges (like study abroad), but also through cultural, sports, and professional exchanges, as well as public-private partnerships, like mentoring programs. I get to build relationships and make connections with the world’s emerging leaders, many of them youth leaders, every day. And they’re the relationships through which we’ll build mutual trust, and leverage in the years to come in the interest of U.S. foreign policy. ECA Exchanges break down barriers that often divide us, like religion, politics, language and ethnicity, and geography. And they give us access to places that are otherwise difficult to reach, in countries like Iran and Cuba for instance, and they help pave the way for future negotiation and official relationships. The State Department has a history of exchange programs for countries with which we do not have official diplomatic relations. And when President Obama announced a new Cuba policy in December 2014, he announced a broadening of exchange opportunities beyond academic exchanges for American students, to include non-academic travel, conferences, and non-credit bearing study abroad, among others. These are exciting times in the international exchange community and the higher education community will be on the front lines of U.S. Foreign Policy through their work on academic exchange programs. Exchanges build connections that engage and empower people, and that motivate them to become leaders and thinkers; to develop new skills; and to find connections that will create positive change in their communities. ECA exchange programs improve America’s foreign relations and strengthen America’s national security. We are fostering a global network of foreign citizens who understand the United States, and Americans who understand the wider world, all of whom can be partners in solving the world’s challenges. And it is the American mobility aspect that I am here to talk to you about this morning. The State Department has a long history of supporting American student mobility. With the support of Congress and the American people, we send over 7,000 Americans – from high school students to college students to young professionals — abroad on State Department sponsored exchange programs each year. Our programs like the National Security Language Initiative for Youth and Critical Language Scholarships provide young Americans with opportunities for intensive language study in critical languages overseas. Our Benjamin A. Gilman International Scholarship Program targets populations traditionally underrepresented in study abroad by offering scholarships for academic studies or career-oriented internships to Pell grant recipients. This program is breaking the ceiling on minority participation in education abroad. Our Fulbright U.S. Student Program sent a record number of American students overseas this year. These recent college graduates, graduate students, and early career professionals are conducting research in large cities and small villages across the globe, engaging with local citizens and becoming part of the fabric of their overseas community, while also gaining important linguistic and cultural skills. The Fulbright Program continues to innovate and find new ways to engage talented, highly motivated Americans early in their careers. I am proud of the programs we offer and the impact they have on the lives of young Americans, but also fully aware that most students who go abroad do so with personal, community, or university resources. About 300,000 Americans studied abroad in 2012-2013, which represents only 1.5 percent of the 20 million American students enrolled in higher education programs at any given time. We lag behind other countries in student mobility, to our detriment. When a Chinese and an American come together to do business, the Chinese business partner has usually spent time in the U.S. and speaks English. He knows American sitting across the table. It’s less likely that the American has spent time in China or speaks Chinese. And that scenario repeats itself whether the other partner is from China, Japan, Brazil, Russia, India, or Germany. We also recognize that the students who study abroad are not fully reflective of the diversity of American society or studying in proportionate numbers throughout countries around the world. The State Department is committed, alongside each of you, to promoting and advocating for the increase and diversification of study abroad participants. I’m excited to tell you that ECA has recently stood up a new U.S. Study Abroad Office to do just that. The United States is a global leader in many fields, including in higher education, and one of our goals at the State Department is to help ensure that young Americans—the next generation of leaders—have the international skills they want and need for a globalized 21st century workplace. Fifteen years ago there were nearly 130,000 U.S. students studying abroad, with this number more than doubling by 2012/2013 to almost 300,000. Yet, with the current annual growth rate of approximately 2%, it will take another 35 years to double again. This is not acceptable. We can – and must – do better. We know the interest is there. Over half of U.S. students enter university with expectations of participating in study abroad. American students face many real and perceived constraints to studying abroad. They may be hesitant to take leave from the universities and colleges where they study, fearing a loss of progress towards degree completion. For those who rely upon income derived from employment, both the short-term loss of income as well as potential increased cost of education for study abroad may prove daunting. It is always difficult to say goodbye to family and friends, who may worry about your safety and security. It can also be intimidating to navigate daily life in a foreign culture and language, and students may also express concerns about missing out on events and activities while away from their home campuses. Nevertheless, we believe that encouraging American students to study abroad is in their best interest and is a strategic imperative for the United States. President Obama and Secretary Kerry are both strong advocates for the value and importance of education abroad. With fewer than 10% of U.S. students taking advantage of study abroad opportunities before they graduate, that leaves over 90% of American students without this vital component as part of their education. It’s an issue of national competitiveness, really. We want to make sure that the future leaders of our country are globally competent, and internationally savvy. We are looking forward to working with all of you to address the barriers to internationalizing education – both real and perceived. Americans who study abroad become citizen ambassadors for our country, sharing American values abroad and pushing back against stereotypes. When American students study abroad they gain critical perspectives and begin to establish networks that enhance their individual prospects in the global marketplace and their future potential as global problem-solvers. At the Department of State, we want to increase the overall number of Americans studying abroad—and we want to do that by reaching parts of American demographics that are currently underrepresented. And it’s not just about increasing diversity in the applicant pool, but in diversity of destination. We want to see more young people travel to destinations where the United States has a strategic interest, to learn critical languages like Arabic, Chinese, Hindi and Russian. When an American student touches down in Seoul or Havana, the world grows a little bit closer and we understand each other more. And that’s in the interest of U.S. foreign policy. The new U.S. Study Abroad Office at the State Department will manage study abroad programs, including our Gilman and Critical Language Scholarship Programs, and explore partnerships with all of you in the higher education community to promote the benefits of study abroad to students, parents, policymakers, and other stakeholders. This office will work in partnership with foreign governments or institutions interested in attracting more American students, and with the private sector, which views a globally competent U.S. workforce as crucial to future economic prosperity. Beyond our programs and our partnerships, we are also launching and exploring targeted new initiatives to support education abroad. We recently partnered with the Institute of International Education and CollegeWeekLive to host the first ever Virtual U.S. Study Abroad Fair on February 25th. Over 3,000 U.S. high school, university, and college students and their families learned about opportunities for culture and language immersion and the development of marketable job skills from over 50 exhibitors, representing countries from all over the world, during the inaugural event. We are re-launching our popular Capacity-Building Program for U.S. Undergraduate Study, which provides institutional grants to U.S. colleges and universities looking to create or expand their study abroad programs, particularly for underrepresented student audiences or nontraditional study abroad destinations. Under previous iterations of this program, which was offered over a period of four years, we awarded grants to 39 institutions in 28 states to increase and diversify U.S. study abroad. The 39 recipient institutions included two Historically Black Colleges and Universities (HBCUs), four Hispanic-Serving Institutions (HSIs), seven community colleges, and one university for the education of the deaf and hard of hearing. Many of the selected organizations have a majority diverse student population, particularly first-generation college students, and others recruited from student populations underrepresented in study abroad or sent students to nontraditional study abroad locations. We are also working hard on several other new initiatives, which we hope to roll out over the next few months. I encourage you all to stay in touch with us through our dedicated email address – studyabroad@state.gov. I’m eager to hear your ideas about how our new office can contribute to the growth and improvement of study abroad. My colleagues at ECA and I are delighted to join all of you in the important work of promoting and advocating for U.S. education abroad. Together, I know we can internationalize the college experience for American students. Let them see the world through your campuses. I hope I have provided a broad overview of our new office and the important work that lies ahead. Let’s think and work creatively together to share the values of study abroad for our workforce and society and to encourage young people to gain a global perspective as part of their studies. Study abroad is important, and it is for everyone. This entry was tagged Bureau of Educational and Cultural Affairs, education abroad, Evan Ryan, study abroad, U.S. Department of State. Bookmark the permalink.